Home / Books / Books about Gujrat / Darbar Shahdaula Pir / History of Chuas of Shahdaula / History of Gujrat / Online Urdu Books / Read Online Urdu Book / Shahdaula Pir / Read Online Urdu Book about Gujrat - "Gujrat aur Shahdaula Wali"
Read Online Urdu Book about Gujrat - "Gujrat aur Shahdaula Wali"
Though Gujrat has a rich history from the era of Mughal Empire. You will find references of Gujrat and its surrounding towns in many books of history of sub-continent but ironically there are very rare collection of books which is written only about history of Gujrat. In the past M. Zaman Khokhar Advocate has written some books about Gujrat and now another book "Gujrat aur Shahdaula Wali" by Muhammad Ehsan Chheena, is a very good addition. 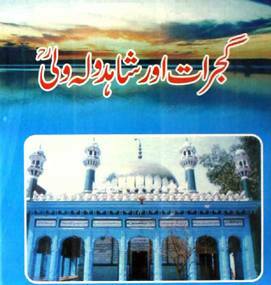 Read Online Urdu Book "Gujrat aur Shahdaula Wali"
Here is this Urdu book "Gujrat aur Shahdaula Wali". It has covered many topics; History of Gujrat, Hadhrat Shahdaula Pir, Facts about Rat Children (Chuhay), Mughal, Sikh and British regimes in this region, Buildings constructed by Shahdaula Wali etc. It has also many stories of kings, queens and princes of that time. This book has 176 pages. Khuram Ehan published it from Rozan Publishers Gujrat and Marfat Library published it online.